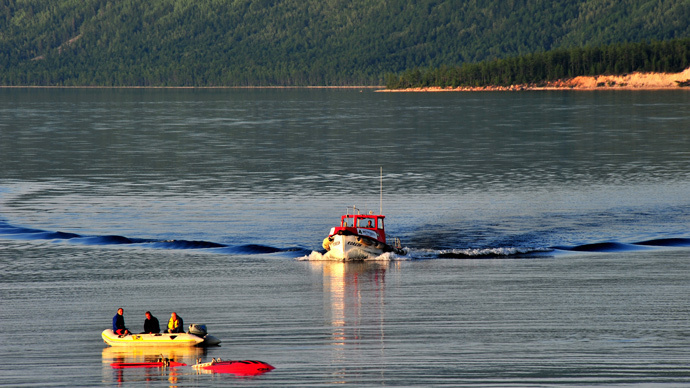 Russian scientists have dropped their new neutrino detector to the bottom of Lake Baikal. It is hoped the telescope, the first part of a greater project, will shed light on the nature of mysterious dark matter – as well as the origins of the universe. The new deepwater, multi-megaton Dubna neutrino telescope was put into operation at the bottom of Lake Baikal by scientists from the Institute for Nuclear Research of the Russian Academy of Sciences (RAS), the Joint Institute for Nuclear Research and a number of other research institutions. The telescope forms the first cluster of the future neutrino telescope named Baikal-GVD (Gigaton Volume Detector). The Dubna cluster consists of 192 optical modules dropped to a depth of 1.3 km. “The telescope will have a module structure, which will be formed from many functionally independent installations – vertical garlands carrying optic modules,” Grigory Domogatsky, a corresponding member of the Russian Academy of Sciences and coordinator of the project, told Gazeta.ru. The next stage of the project will include the successive deployment of new clusters, which will increase the functional volume of the neutrino telescope. By 2020, Baikal-GVD will be comparable to the modern largest neutrino telescope, IceCube, with 10-12 functional clusters and a total volume of 0.5 cubic kilometers. During the second development stage, the Baikal-GVD telescope will be enhanced with 27 more clusters with a functional volume of 1.5 cubic kilometers. The new telescope is designed to study the high-energy neutrino stream – a stream of bantam fundamental chargeless particles. The scientists expect the neutrino telescope to engender a cascade of charged particles in the waters of Baikal after penetrating through the earth’s stratum. Neutrinos (in Italian, "little neutral ones") are almost massless particles that, unlike electrons, carry no electric charge. Since they are chargeless, they rarely interact with other particles. They are the most mysterious of the known particles in the universe. The irradiance created by a charged particle formed by neutrino and moving with a speed higher than the speed of light in the water is what the optical modules of the installation will actually detect, the scientists say. Neutrino detection at the bottom of Lake Baikal will help scientists to understand the high-energy space processes as well as the origin of the highest-energy particles ever found. “The neutrino stream comes laden with a wealth of information about our world, which is unique in many regards,” said Academy member Valery Rubakov, the leading scientist of the nuclear physics section of the RAS physical sciences division. “These studies will be the key to understanding of early stages of the universe’s evolution, along with the nature of the forming of chemical elements, the evolution of stars and even shed light on the nature of dark matter,” he added. The project was praised by Christian Spiering, the head of the Global Neutrino Network, who previously led scientists’ cooperative effort on the IceCube project. The first attempts to build neutrino telescopes were undertaken in the 1960s. At that time they were build underground, so their size was severely limited, while the detection of high-energy neutrino demands the functional detection volume of 1 cubic kilometers that is still shielded from other particles able to influence the stringency of the research. Later, RAS member Moisey Markov suggested building the telescopes deep underwater so the water could act as a filter and working substance. The first such telescope was built in Russia in Lake Baikal in 1993 at a depth of 1.2 km. In 2008 another such telescope, Antares, with a functional volume of 0.01 cubic meters, was built in the Mediterranean Sea not far from the French city of Toulon. Two smaller telescopes were also built near Sicily, Italy and Pylos Island, Greece. A total of 42 institute and university groups from 12 European countries have joined together to build international neutrino telescope KM3NeT, which will be put into operation in 2016-17 and will be the biggest such telescope with a functional volume of several cubic kilometers, according to the project’s website. In the meantime, the largest modern neutrino telescope, IceCube, with a functional volume of 1 cubic kilometer, built by researchers from the US, Germany and Sweden, is situated in the ice at a depth of 1.5 km to 2.5 km not far from the US Amundsen-Scott Arctic station. It has been functioning since 2013 and has been first to detect the high-energy neutrino originated beyond the Solar system.